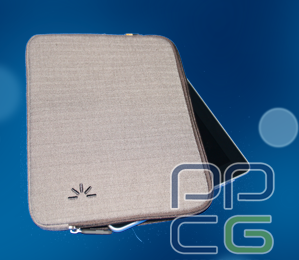 PPCGeeks.com – Review: iPad Case – Black (IPAD-101) vs. iPad Case – Herringbone (IPAD-102) from Case Logic. Review: iPad Case – Black (IPAD-101) vs. iPad Case – Herringbone (IPAD-102) from Case Logic. UPDATE: Congrats to the winner of the case, O.A.T.! You’ll receive a PM with instructions soon! My friends call me the “Case Lady” because I go through so many cases for my precious toys. Since I acquired my iPad last May I have purchased more than five cases of different styles and purposes. There is always that new one that I just have to try. Imagine my joy when I had the opportunity to try out and review not one, but two cases from well known Case Logic. Though similar in purpose, each of these two cases also has unique individual features. Both cases are well padded sleeves with wrap around zippers and slim styling. As with most sleeve styles there is no strap or carrying handle suggesting the best uses would be for a quick trip from the office to the meeting room or to slip inside a bag, briefcase, purse or other carryall. The black (IPAD-101) is made from a semi-shiny nylon material that is very clean and durable with a contrasting teal liner. The herringbone (IPAD-102) is made from a woven cloth material that is suited to a business look with a not-too-bright orange liner. Both products are very pleasing to the eye and are cleanly constructed with strong seams, rounded corners and finished edges. I asked my male friends which case they would prefer based no looks alone and all agreed they would easily use either one so case styling is truly gender generic. The obvious difference between the two is in the fabric material. However, size differences also come into play; the Herringbone style is an exact fit to the iPad with virtually no extra room. The iPad slides right into the landscape-oriented opening and the case zips closed easily. When I put my soft shell on the iPad I am still able to slide the iPad into the case easily though the zipper is a bit snug. So far, with several weeks of use there has been no signs of excessive wear on the zipper from this setup. The black case is actually much larger, as seen in the photo. The ipad fits loosly into the portrait-oriented opening with plenty of room to spare. In fact, I was able to easily place my HP netbook into this case and close it up, great dual purpose! In order to duly test these Case Logic productss, I ditched my portfolio style case and pulled on the sleeves. I recently had a stint with Jury Duty and took my iPad, incased in the Black (101) sleeve, to help pass the time. The experience was rewarding. I was able to carry a few essentials (ID, cash, pen, phone) inside the case no need to carry extra baggage. The case also is great for security scanners since there is no requirement to remove the iPad. With this case I am not concerned with wear and tear, dirt, or snags as the material is very durable and yet pleasing to the eye. The Herringbone style case is much more business-like and eye-catching. I used that model during the work week, carrying my ipad as I would a folder or clipboard to my meetings. I have to say several collegues were impressed with this look. At the end of the day, I have to say my favorite is the herringbone, though I used the black case more often. I am mostly concerned with the durability of the fabric, though I have had no adverse experiences. I have been known to be rough on my possessions and I do fear snagging or staining the product. I did not realize how much I would enjoy the sleeve experience as I always thought the portfolio was the way to go. I am happy to have had the opportunity to try the Case Logic products and I really do not miss the portfolio. Sleeves are so much thinner, easily fit into any bag or pack and can be used with the gel shell backing. The only complaint is I have yet to find a nice femine pattern or color that is not too girly or over the top. When I do, I will finally be satisified in my case quest… Yeah, right! Thanks for the cases Caselogic! Now we’re going to give one away! You have until November 20th to Enter!